SNOW-WHITE CAMEO DEVICES! This is a date that has been increasingly elusive over the past few several years. 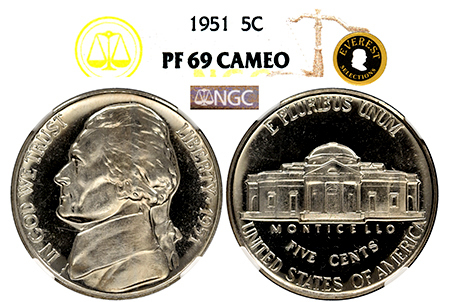 1951 Jefferson nickels of this caliber, with excellent cameo contrast and Proof 67 surfaces, rarely turn up anymore – most examples have found their way into collections. This superb specimen appears essentially as struck 66 years ago, as pristine and haze-free as the day it was struck, with gorgeous matching obverse/reverse cameo contrast! And there are only 27 graded!